In recent years, I've become quite enamored with orange nail polish. Pale, bold, bright, creamy, shimmery, glittery ... whatever the orange, I want to wear it! And in the past few weeks, these two by Essie and Ciate have really taken the cake. Keep reading to see why. 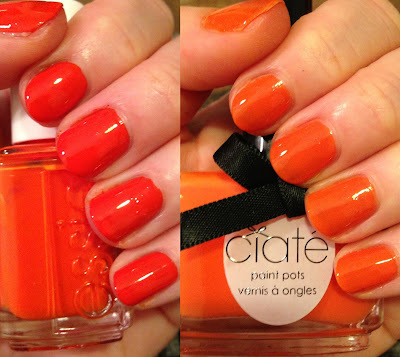 Ciate Speed Dial Paint Pot is one of those colors that, at first glance, doesn't really look like much. It's pale and seems like it wouldn't really work on a pale skin tone. But you know what? Once I swept on two coats, how quickly my opinion shifted. The formula is perfection, the color actually seemed to bring out the cool undertones of my Casper-colored skin, and the finish is just pure creamy goodness. Plus, who doesn't want a nail polish bottle that's tied with a pretty black bow? Essie Orange, It's Obvious! is originally from the Spring 2012 Navigate Her Collection. Not new, to be sure, and you know what? It's been sitting in my bag of polishes to try since it first came out. (Um, oops.) I honestly can't believe it took me this long, because THIS. COLOR. IS. GORGEOUS. It's bold and bright without looking neon, it's a true showstopper, and it glides on effortlessly in only one coat. I'm kicking myself for not wearing it sooner! What's your favorite orange nail polish? Let me know in the comments! I am a big fan of orange nail polish! Especially on my toes. I love the Ciate here. Looks fabulous. Gorgeous color! Wear oranges all the time! Love that orange nail color. I am not a fan of orange nail polish but upon seeing this, I wanna try it out. This will def be in my purchase list.